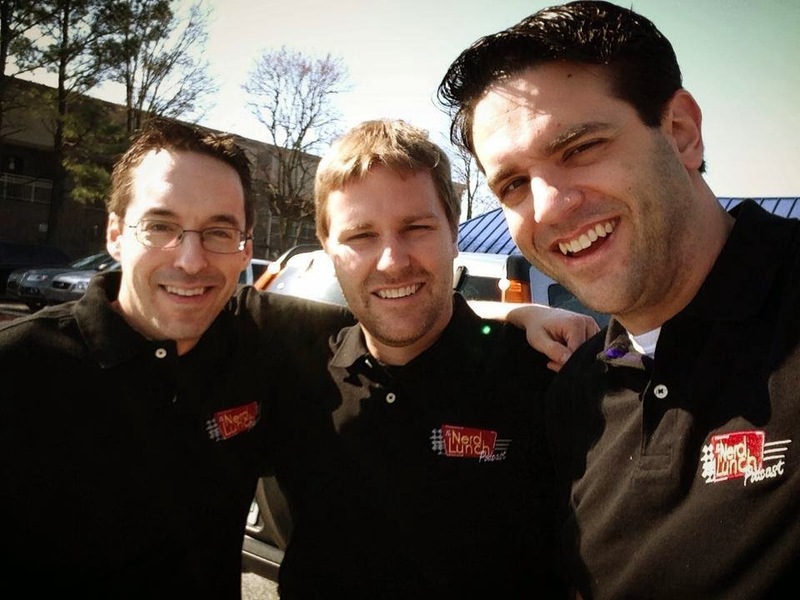 I have been so busy with my "day job" that I have severely neglected my blog. But I'm taking some time to catch up over spring break, and I want to share this beautiful project from earlier in the year... before Easter has come and gone! Isn't it gorgeous? I love everything about it! 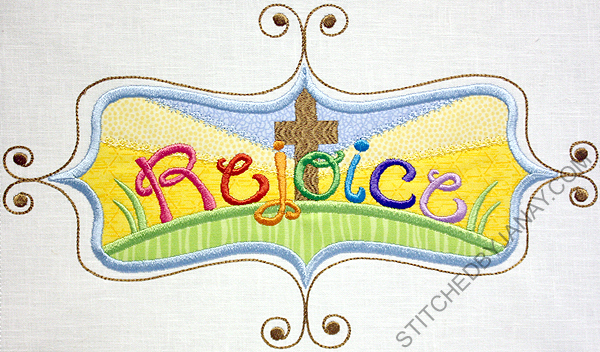 The way the fabrics are tacked down and top stitched for the gradient sky, the texture of the cross, the font choice... it's beautiful! 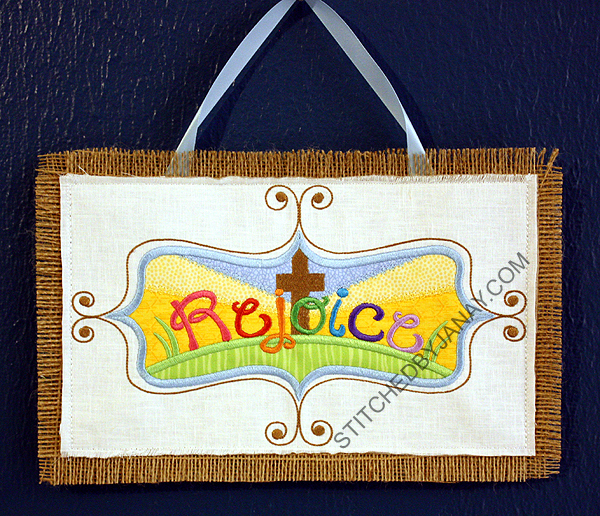 I stitched it on a nice woven fabric first, then before I unhooped I floated two layers of burlap and a loop of ribbon under my hoop and added a triple-bean stitch rectangle around the perimeter to tack it all together. Trimmed it and frayed it and turned it into a wall hanging for myself! When I hung it up my daughter said, "Oh is that for Easter?" and then immediately said it was good anytime though. That's exactly right! We can rejoice in our risen Savior every day of the year! BUT he did make a request... Oh, about a year ago? 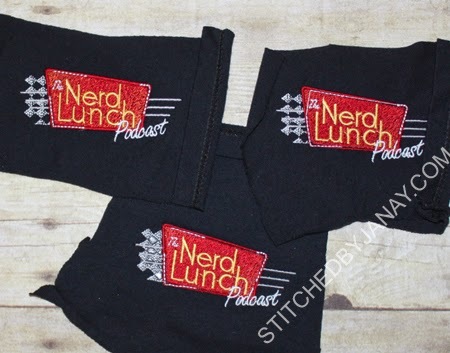 He has his own blog and records a weekly podcast with like-minded friends, The Nerd Lunch Podcast. He asked if I could get his logo digitized to embroider on items. 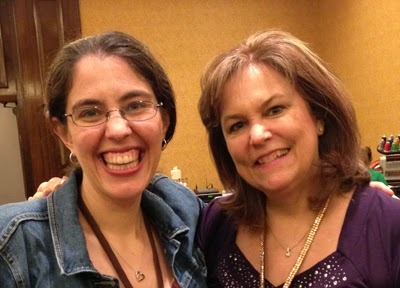 Last year I contacted Whitney of That's Sew Grammie to see if she was up to the challenge. This logo includes fading checkerboard, gradient background, reflection highlights, and lots of lettering. 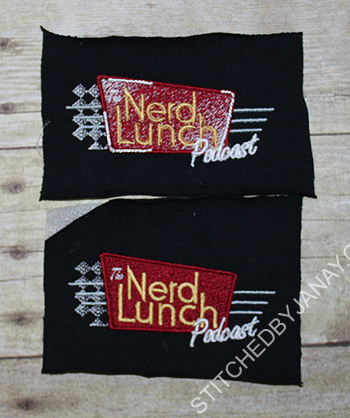 All squeezed into a 4" wide design and stitched with thread?! She tackled it with a "bring it on!" attitude. The first draft design attempted to cover all bases. I tested it as is, and then stitched a simplified version. -the checkerboard turned out awesome! -We decided that my thread choice for the gradient was too harsh, so I swapped the white underneath to a dark orange and then it worked great! Thrilled with the gradient effect. 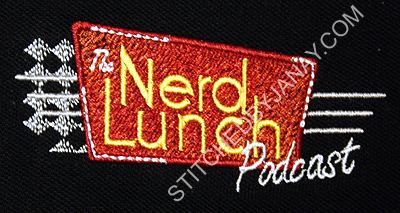 -The top stitching on the text "Nerd Lunch" was a valiant effort, but at this size didn't translate well in thread, so it was eliminated. 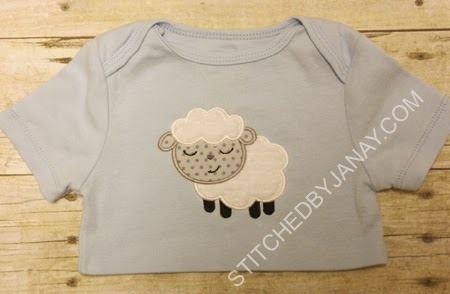 Then I stitched it a few more times to get my thread choices just right. 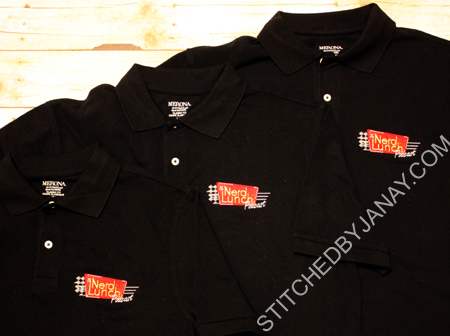 We were please how it came out, ESPECIALLY considering how non-embroidery friendly the logo was to start with! :) So if you are looking for some custom digitizing, I would highly recommend Whitney! You can find her on Facebook and her site That's Sew Grammie! I ordered these super cute pajamas during ARB Blanks' spring PJs preorder, and when they arrived I then had to decide what to put on them. About that same time I2S had released some cute "sleepy" animal designs. I loved the lamb for Annaliese, and sweetly asked my boss if she would create a boy version (less swirly wool, no bow, no eyelashes) for Dashiell,and she did! Aren't these adorable? 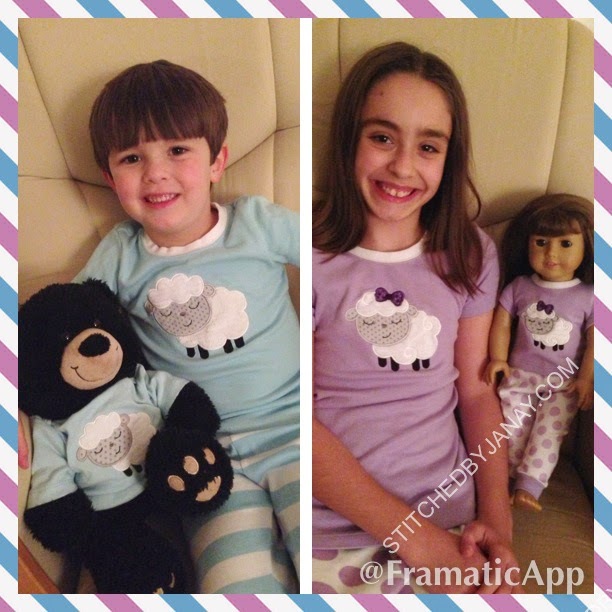 I also ordered a pair of doll sized PJs for Annaliese's American Girl doll. I took the 4x4 size of the design, reduced it (maybe to 75%? ), increased pull compensation to widen the satin stitches back up, and stitched away. Turned out so cute, I love Embird! Dashiell has been rather miffed every time Annaliese gets a matching doll clothing item and he doesn't get something for his BuildABear, so this time I found a blue onesie in my stash and made something for him. He was SO excited and appreciative :) I chopped it off and used steam-a-seam to "hem" it. Ha!